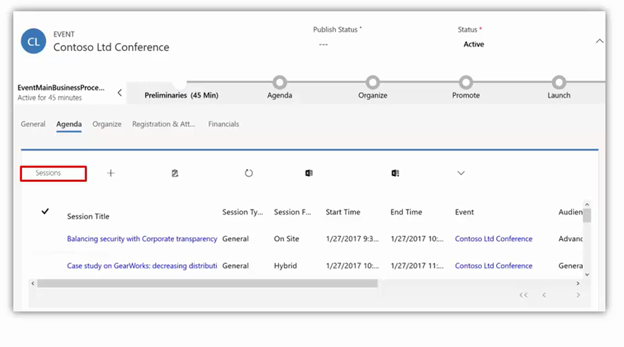 In the Dynamics 365 for Marketing July 2017 Update, Microsoft has added the Event Management module that builds on existing marketing capabilities to help event organizers plan, manage, and process events. The data captured while managing events is embedded into your Dynamics 365 customer and prospect data, so you can learn more about your customers and drive business forward. If you have ever managed an event before, you know how important it is to keep your agendas, costs, vendors, venues, registrations (the list goes on and on) organized. You also understand that event planning spans across departments and that collaboration with your teammates is vital to planning a successful event. Finally, you know that the whole point of your event is to learn more about your attendees and drive your organization’s objectives forward. 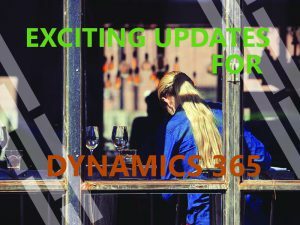 You can now do all of this with Dynamics 365! 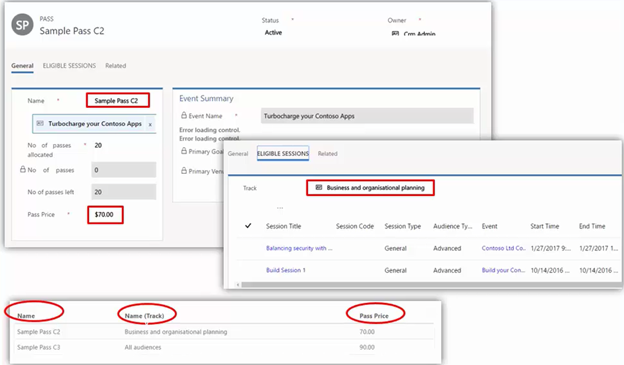 This blog post will preview some of the components introduced in the Event Management module. These components are all easily configured and customized to fit your organization, whether your events are focused internally (like a company party) or an externally (like a customer conference), or both. The Event record is the main entity record in the Event Management module. This record will hold all information related to an event, such as general information, logistics, registration and attendance, and financial information. Events can be organized into Sessions and Tracks, so that you can manage details of the event discretely. Events can be configured with a business process flow that will organize information and tasks that need to occur throughout different steps in the event lifecycle. Events are customizable, so if your event management model doesn’t follow the out-of-the-box process flow, you can customize it. You can also modify the information that appears on the Event record. Venues capture the details of the physical or virtual location for the Event. Venues can have Buildings and Rooms, so you can be as specific as you need to when defining the venue for an Event or Session. There are two components of Event Registration in the Event Management module – Registrations and Check-ins. Registrations keep track of the people and organizations that intend to attend your event. 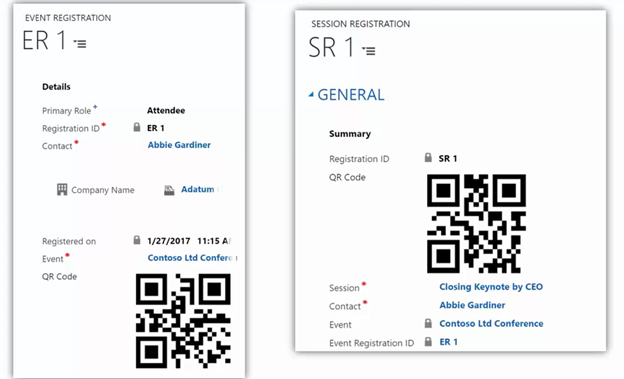 Registrations records can generate QR codes that your attendees can use to check-in at the Event or Sessions. When the QR code is scanned, a Check-In record will be created in Dynamics 365. Check-ins can be used in the future to drive business with your customers and prospects, or to solicit event feedback from the attendees. Registrants can purchase Passes for an Event, Track, or Sessions. The Pass record will contain its cost, number available, and number left for its corresponding Event, Track, or Session. Passes ensure that Registrants can only attend Sessions that are included in the Pass that they have purchased. You can track Sponsorship for the Event with Sponsorship records. The Sponsorship record includes details of the amount sponsored and the sponsorship type. 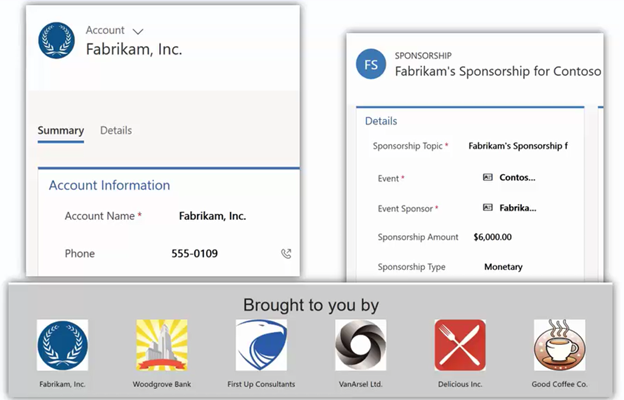 Sponsorships link directly with Accounts in Dynamics 365. 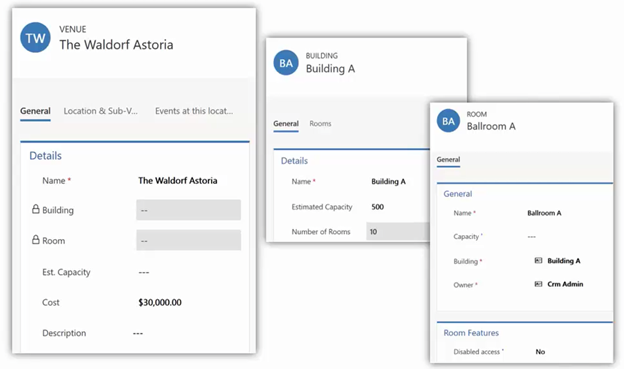 Included in the Event Management module is an integrated Event Portal. This gives your audience a landing page to learn about your event, register for your event and share it with others. 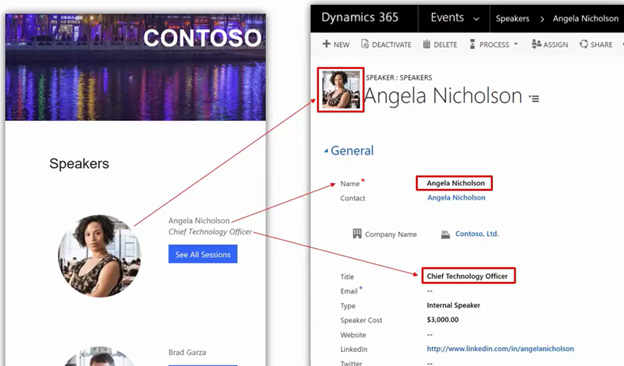 Information that is displayed on the Event Portal is easy to customize, as the key details are feeding directly from the Event Management records in Dynamics 365. 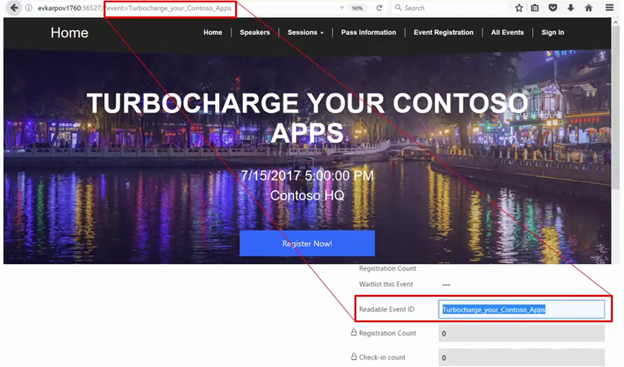 The Event Portal has an auto-generated readable Event URL that makes it easy for your interested parties to share your event page. 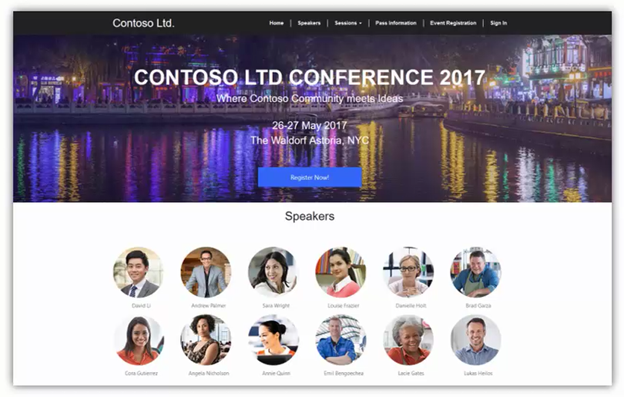 Speakers and Speaker Engagements are records within the Event Management module and feed directly into the Speakers page of the Event Portal. 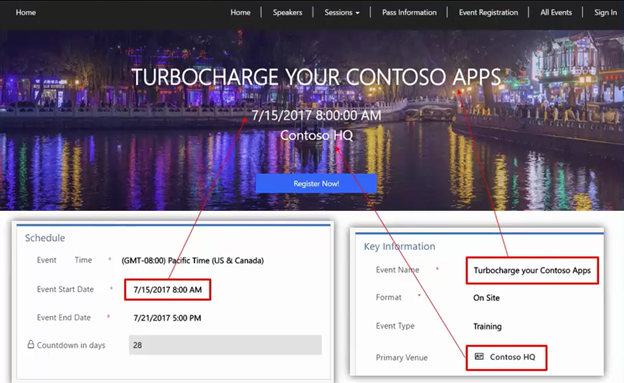 The Event Portal makes it easy for your registrants to sign up for the Event, Sessions, and/or Tracks that they are interested in. They can also select Passes to purchase on the Event Portal. 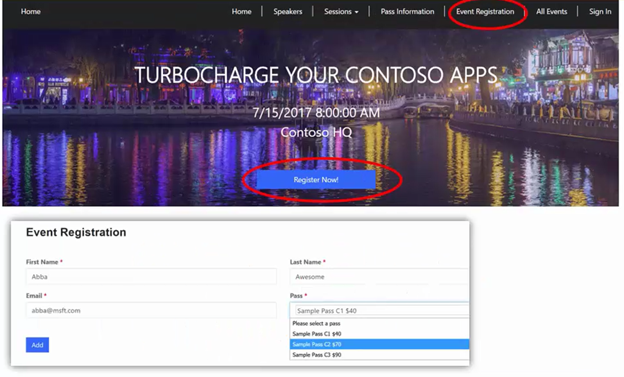 These self-service registrations will feed directly into Dynamics 365 as Registration records. In addition to creating Registration records, a Contact record will also be created. On the Contact record you can view a complete history of events attended. The most exciting aspect of this module is that it’s fully customizable, which means that you can use this tool to manage just about any kind of event right within the Dynamics 365 platform. Please note: All content and information is presented on preview versions and not the launched product. Product is subject to changes per Microsoft’s discretion.